Meet the real live Spinal Tap. 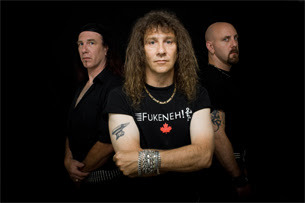 This band, Anvil, stars in an indie documentary so bad it's good. We've talked to many friends and had lively debates about whether it was a mocumentary or reality. Yet, here they are in the flesh. Come decide for yourselves. If you can't make it to the show, check out the movie of the same name. My husband declared it "weak" but I enjoyed it. There's something endearing about the rock star wannabes, slogging away at dead end day jobs and still trying to be a big time metal band long after most men their ages have let their dreams get beaten down. I thought it was poignant and passionate, and pretty amusing, too. Mostly, I found myself routing for the underdog and hoping that their rockumentary fame brings out a few more fans to their live rock shows.